Well, here I am after two days without electricity and, therefore, internet access, acknowledging that I was out of line. After all, I did almost double-dog-dare you on the ice storm and power outage stuff. Guess you showed me! However, we really need to clear up the groundhog in charge of the weather thing. I know this celebrity business and national attention must be a real high for you. After all, you are “just” a groundhog, albeit a fine specimen. But, you and I both know that the legend surrounding you seeing your shadow and foretelling six more weeks of winter is just man’s futile attempt to feel in control of future events by predicting the weather. And, I have to say I’m really sorry for whining about my little inconveniences. So the power was out for a couple of days? We have a generator. Maybe I couldn’t do laundry and run the dishwasher and cook big meals for my family (which I really like to do when I’m home). But I was warm, had hot water for a shower, hot coffee to wake me up, and lights to read by. I don’t have to have propane to warm my home. My heart aches for the thousands of Americans who are still struggling with dangerous driving conditions and prolonged power outages, propane shortages and skyrocketing prices, and just plain old freezing cold temperatures. So, hey guys, my prayers are with you. And, I am compelled to acknowledge the true Creator of all things, including the weather. I never really forgot Him, but was impressed anew by the reality of the wonder of His creation when I viewed the photograph shared by a friend this week. So, Phil, enjoy the limelight but remember who made you (and me) and who is really in control. 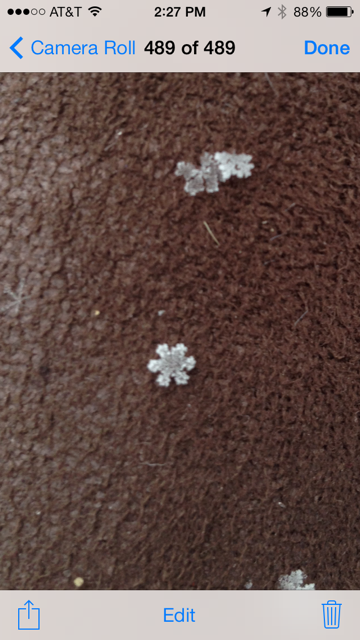 A snowflake has reminded me. Thank you so much for the nice comment on my interview. I really appreciate it. Thank you for your kind words. The validation means more than you can know as I learn to blog.